On December 27, 2000, 10 years ago today, Mario Lemieux returned to the NHL as a player after three-and-a-half seasons in retirement. The press conference, held Dec. 11, at the Marriott City Center was televised live by eight media outlets, and the news sent shock waves through the hockey world. 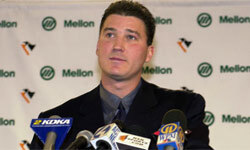 It was only a few weeks earlier that Lemieux had revealed his plans to a small group of Penguins executives. Penguins VP of Communications Tom McMillan recalls those amazing times. “I need to see you guys,” Mario Lemieux said in that understated manner of his, wagging his finger and flashing a wry grin. This was late November, 2000, barely a year into Lemieux’s unprecedented tenure as owner of the Pittsburgh Penguins, and, curious as he was about some of the inner workings of his new business, it wasn’t unusual for him to call a few of his employees - in this case, me and then-COO Tom Rooney - into his office for a chat. Only this time he closed the door. Not known for his grasp of theatrics, he nonetheless paused for effect. A zillion things flashed through my mind in a matter of seconds. Moving in a different direction? What did THAT mean? Was he stepping down? Selling the team? Chucking it all and moving to Florida? Lemieux leaned forward again, began to smile ever so slightly and cleared this throat. To this day, more than 10 years later, I can still remember what I was thinking. Right, Mario. What’s the punch line? But then it started to sink in a little. Coming back? Did he really say coming back? With me stunned to silence by the seeming absurdity of the moment, it was left to Rooney, my boss at the time, to ask the only pertinent question. Lemieux laughed and nodded his head. Thus began the marketing of the greatest and most improbable comeback in hockey history, maybe all of sports history. Lemieux had retired in 1997, at the tender age of 32 - worn down by battles with cancer and repeated back ailments and a disdain for the clutch-and-grab mentality that had overwhelmed the game he loved. He’ll still tell you that the plan at the time was to walk away and never look back. But the unexpected specter of bankruptcy and the possible demise of the franchise he’d led to two Stanley Cups created a slow but dramatic change of plans in retirement. Talk about moving in a different direction. 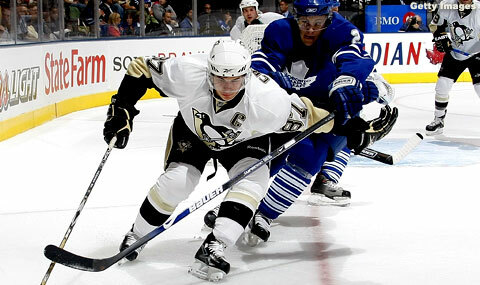 The Penguins filed for Chapter 11 bankruptcy protection in October, 1998. In the early months of 1999, Lemieux, the team’s largest creditor - still owed more than $30 million in deferred compensation from his playing days - decided his best course of action would be to lead a group of investors that would buy the team, keep it here in Pittsburgh and restore its good name and luster. Joined by billionaire Ron Burkle and a group of dedicated local investors, “Lemieux Group” was awarded the franchise on Sept. 3, 1999. Lemieux was a regular at the office and cut a familiar figure at the rink, although he kept his distance from the locker room out of respect. But as time went on, as he watched the team and analyzed from above, he started to feel a strange sensation: competitive juices. He thought quietly about playing again. But, nah, that couldn’t happen. Lemieux still watched from above as the Penguins lost to the Philadelphia Flyers in the 1999 Stanley Cup playoffs. He watched from above at training camp in 2000. He watched from above as the team opened the season in Tokyo, Japan, against the Nashville Predators. The strange sensation wouldn’t go away. At first, Lemieux confided his preliminary comeback plans only to a tiny group of closest friends. He took an exercise bike home from the arena, but people around the office thought he just wanted to stay in shape. He started to skate in the mornings at the Island Sports Center on Neville Island, but the cover story was that he was shaking off the rust for the team’s big alumni game that winter. He missed a few meetings and wasn’t seen much around the office in the early part of November. Oh well, we all thought. He is the owner. He can take some time off if he wants. I stepped out of the office and ran immediately into Mario’s long-time friend, Tom Grealish. “What are you doing here?” I asked Grealish. “I wanted to see the look on your face,” he shot back. Problem was, we were told we had to keep this tantalizing secret to ourselves for at least a week. Talk about pressure. The league had to be notified, the Board of Governors, the NHL Players Association. Nothing like this had ever been contemplated before - an owner coming back to play. Other employees went about their business, oblivious to the earthquake that was about to shake the hockey world. For a few days more, not even the coaches or players knew. Finally, on Thursday, Dec. 7, I got a call from Kevin Allen, the veteran hockey writer from USA Today. He wanted to give me a heads-up that he was posting a story on the internet in the next half-hour that Mario Lemieux was returning to the ice as a player. What happened next happened fast. The news tore through the wire services and across the internet and spilled into 24-hour talk radio. I checked my phone and had 42 voicemails in the space of an hour. The New York Times called. CNN. Sports Illustrated. Good Morning America. So for four days there was a crescendo of speculation, media talk, fan chatter, culminating finally in a press conference on Monday, Dec. 11 at the Marriott City Center in Pittsburgh. The place was jam-packed. Eight television outlets from the U.S. and Canada carried it live. When I walked to the podium to get things started, I was literally blinded by the TV lights. There were maybe 100 people in the room and I couldn’t see anybody. “You looked nervous,” a friend of mine told me afterward. “I WAS nervous,” I said. Then Lemieux strode to the podium and made it all official, talked about how exciting it was going to be for his son Austin to see him play, talked about the rare opportunity to take a mulligan on retirement and fulfill his own destiny. “I can’t wait,” he said, and then he walked away from the cameras, moving at his own pace as always, moving in such a different direction that something like that will never happen again.